Kenmare News | Book your Kenmare Chronicle now! Book your Kenmare Chronicle now! The 2019 KENMARE CHRONICLE will be available from the end of November. 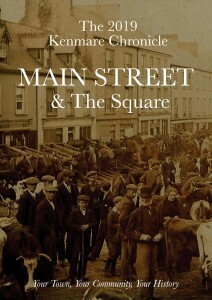 This year we have been concentrating on chronicling the families and buildings of Main Street and The Square. A special thanks to everyone who has contributed to this publication and the World War 1 Commemoration edition we produced for the 11 th November. We have started collecting material for next year’s production already and if you have any stories or pictures relating to the side streets of Kenmare, like Rock Street, Market Street, Parnell Place, Davitts Place, Brennans Row, Bridge Street…etc please send them into us. info@kenmarechronicle.com mobile 087 2953990 or call out to Willlowfield Garden Centre. Thanks again , Simon.